We felt that most of the lists for the best Haleems across Hyderabad have never been updated. Some of the outlets have ceased to exist while others rely on crowd sourcing. A personal opinion in compiling an extensive list has been lacking. So I’ve taken on the task to have at least 30 Haleems this year to provide an updated list of places in Hyderabad. Kindly note the word ‘personal opinion’ and all of these have been personally tasted and compiled. The Ramzan month especially heralds the start of our “Iftaar Walks”. If you haven’t signed up yet, all of the event details have been posted on the FoodDrifter facebook page. 1. Pakwaan Grand : If there was an award for consistency, these guys deserve it more than anyone else. It’s been 3 years since I’ve had my Haleem here and they have blown my mind every single time. I mean just look at that plate of Mashad Haleem. The recipe uses chunks of mutton with minimal bones. The result is a much meatier and flavorful Haleem than anyone else. Generously added on top are Ghee, Cream, Fried Onions, Pistachios, Cashews and Lime. It had come very close to being the No. 1 on our list last year. This year it might just be? 2. Simply South, Filmnagar : One of my favorite Haleems of last year. In fact they’ve been so consistent with their Haleem that I drop by for a visit no matter what. A makeshift traditional handi over firewood is made at the back of the kitchen. All of the spice mix is hand pounded and the Haleem made using the traditional recipe. This year Simply South has tweaked the grain to make it a different variant of white broken wheat. This lends it a much darker shade due to the spices and meat. The recipe is more of the Nizami style with a great flavor profile coming off the peppercorns and cinnamon. Its quite a huge quantity, enough for two people. Served alongside are the fresh lime wedges, mint, fried onions and cashews. 3. SodaBottleOpenerwala : A Gyarah Haleem fest which started off last year with great success has been recreated this year too. Expanded to include an outside stall for the showcase of all the Gyarah Handis, they’ve gone on to make nearly 3 veg variants. But Haleem and vegetarian, two words which shouldn’t be used in the same sentence. In fact I’d go nowhere close to the Chicken one too. But they should be awarded high marks for the Duck, Turkey and Prawns variants. Absolutely nowhere would you be able to get such varieties. But my standard order as always went for the Persian Haleem. Their Persian Haleem till date remains an absolute favorite of mine among the Gyarah Handi. Mild on spices, a nice little wheatish color and the strings of mutton that I can feel with every spoonful. They’ve now tweaked their Irani Haleem too. 4. Peshawar Restaurant, Lakdikapul : I was quite excited to try the Haleem at Peshawar despite the fact that this is the first time they’ve put a stall. The restaurant has slowly but steadily become one of my favorites in the city. The Nalli Barrah, Chapli Kebabs and Biryani are some of the best you can entice your tastebuds with. 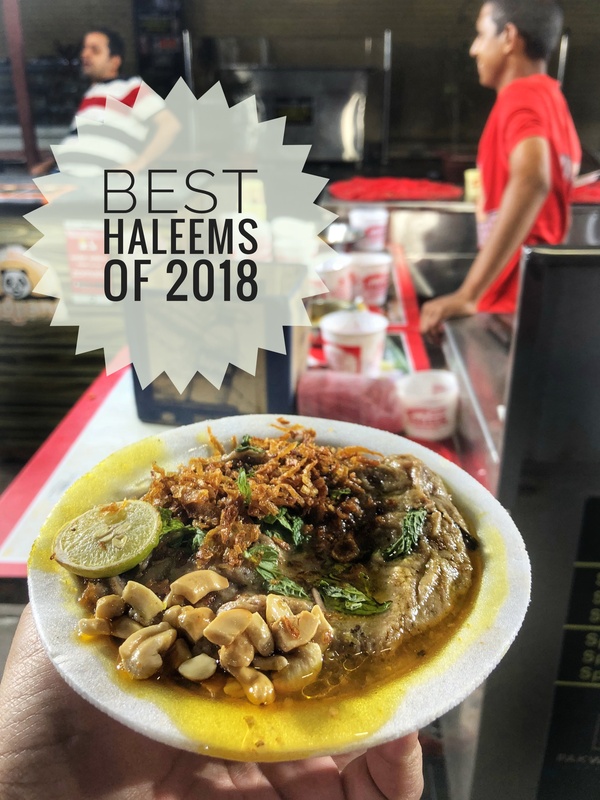 But we’re here to talk about the Haleem, aren’t we? Mild on spices with beautiful chunks of mutton in every bite. They’ve done a very good balancing act between placing the taste between a homemade Haleem and a commercial one. I’d make do without the whole peppercorns which seem to appear once in a while. The texture is lovely and also ain’t that rich that you can’t slurp down a bowl. But this year I’ve gone back to pushing away my earlier notions of the past and giving old haunts another chance. And I’m glad this led me back to Al-Saba. For all the people who live towards Gachibowli, do yourself a favor and chuck the Shah Ghouse and Pista Houses. Al-Saba is actually so so much better. Plus I really really liked the fact that they were patient in explaining it to a Haleem newbie with a smile when the person beside me enquired about it. The refill of brown onions and mint was given to whoever asked. And most importantly there was no Sherwa but gher which they dolloped on top. It has definitely won me over. 6. Cafe Bahar : There is something about going back to the oldest cafes in Hyderabad. An underlying reason as to why such legendary places continue to survive despite the expansion of the rest. Cafe Bahar for me is one such. Their Biryani till date is one of my favorites. But its their Haleem which has remained consistent too year after year. There is no over the top marketing or combos offered. Other than the pet bottle of pepsi you get free with you Haleem, one that they’ve been giving for years now. The Haleem is still great, the person at the counter still smiles as he hands me over a bowl. And neither do they object when I ask for a refill of some fried onions on top. People park their vehicles, have a quick bowl and go about their way. Cafe Bahar continues to be a legend in its own way. 7. Ohri’s Group : Ohri’s Group of restaurants have a lovely iftaar platter across few of their outlets with Jauzi Halwa, Dates, Lukmi and Haleem. The Haleem was quite flavorful and rich. Doesn’t go overboard with the spices and maintains consistency. Infact, I did keep some in the refrigerator to be had the next day. And my morning breakfast consisted of Toasted Bread with a spread of Haleem. Has anyone tried it this way? Also btw Haleem on Pizza is the absolute BEST. 8. Hotel Nayaab : And diving right back into our Haleem stories is this one from Hotel Nayaab. A little spicy, very peppery and overall a great texture. Hotel Nayaab is one of the initial Cafes which started serving Haleem commercially. What was supposed to a breakfast dish soon became a Ramzan special coz of the preparation time and heaviness of the dish. 9. Cafe 555, Masab Tank : First up is the legendary Cafe 555. You’d imagine that this Irani Cafe which was a favorite of mine 2-3 years ago and still does good numbers would be making delicious Haleem. Sadly not, 3 spoons down and I couldn’t have it anymore. The bones were minimal but it was just damn spicy. I actually kept getting whole peppercorns in my mouth. The ratio of meat has significantly reduced. And they really need to clean up the place, its much dirtier than I remember it to be. Its just the start of Ramzan so hopefully they take care of this as the month progresses. The sherwa was still great though. They are really famous for their special Haleem which is topped up with Chicken 65, Zubaan and a boiled egg. Top it with anything, but if your base ain’t good. It just doesn’t work then. Enjoyable but a shadow of it’s former self. 10. Hotel Sohail :This year it has been a bit disappointing of sorts when it comes to the Haleems at the legendary outlets. Maybe its that the newer entrants have upped their game. Or the fact that I’ve been having some really good stuff as of late. I mean don’t get me wrong, the Haleem from Hotel Sohail was nice. But you know the feeling that it could have been so much better. They top up the Haleem with two types of ghee. One in which onions had been fried and one the regular. Good stuff though. 11. Hotel Shahran : Another one among the Haleems from Old City. I should really stick to either the Boti or Seekh Kebabs with Warqi Paratha. The Haleem is definitely not their strong suit. In fact they were so much better last year. All I could feel in mouth was fat from the mutton. Entirely coated my throat making it hard to swallow another spoonful. This is one money which could have been better spent elsewhere. 12. Shahi Dastarkhwan, Lakdikapul : When located in front of better ones as the newly opened Peshawar and Chicha’s , you really need to pick up your socks to make a very very good Haleem. But sadly Shahi Dastarkhwan didn’t really put that to any use in their Handi. None of the large LEDs, bright enough to replace the street lights will be able to get in customers if you’re product isn’t good. The Haleem is very pasty where the broken wheat’s taste overpowers the taste of meat. Also it doesn’t help that they have a large number of whole peppercorns.